Quarterback Braxton Miller #5 celebrates a third quarter touchdown with wide receiver Philly Brown #10 and offensive linesman Pat Elflein #65 of the Ohio State Buckeyes against the Michigan Wolverines during a game at Michigan Stadium on November 30, 2013 in Ann Arbor, Michigan. FORT LAUDERDALE, Fla. (AP) — Ohio State offensive lineman Corey Linsley needed about a week to get over the disappointment. Given the stakes, that sounds fair. If a play or two had been executed a bit better, then maybe Ohio State would have beaten Michigan State for the Big Ten title — and wrapped up a spot in the BCS national championship game. Instead, the seventh-ranked Buckeyes (12-1) not only tasted defeat for the first time in 705 days, but were knocked out of the title picture and wound up getting invited to the Orange Bowl. As far as consolation prizes go, that’s not exactly a rough one. "It really stung, obviously," Linsley said. "I think I can speak for everybody on the team when I say it really stung. But with guys like this, with the character we have on this team … it doesn’t take a long duration of time to get over something like that. We know we’re going to face bigger tests in life." The next test awaiting Ohio State is No. 12 Clemson (10-2), which is back in the Orange Bowl for the second time in three seasons. And even though the crystal football is out of their reach, the Buckeyes insist there’s plenty of reasons to be ready for Friday. There’s the not-so-small matter of going out winners, which is always a goal. A top-five ranking to finish the year would likely be within reach. On top of all that, a victory would make Ohio State 25-1 over Urban Meyer’s two seasons in Columbus — matching the winningest two-year stretch in school history — plus make the Buckeyes’ coach 5-0 all-time in BCS games. "Since you mention that, that’s a huge thing at Ohio State," running back Carlos Hyde said. "This program has so much tradition and to be one of the first teams to be 25-1, that’s huge here. That’s definitely like history, right there." If Hyde needed any extra reason to be inspired for his college finale, it’s being played about 100 miles from Naples, Fla., where he attended high school. But to hear him talk on Tuesday, playing a game like this in any locale would have been good enough for him. "This is a BCS bowl. This is still a huge game," Hyde said. "You don’t really need too much motivation. Even though you came up short to play for the (national championship), you know, this is still a huge game. Just got to get past that last game. I’m sure we are past that. I feel like we are. You don’t really need too much motivation." But the chance for an eye-popping number doesn’t hurt, either. Over the past decade — when teams playing up to 14 games in a season has become more and more commonplace — the only programs to go 25-1 or better in a two-year span are USC, Boise State and TCU. That’s a lot of wins, isn’t it? "That’s a lot of wins, isn’t it?," asked Ohio State offensive lineman Jack Mewhort, smiling. He paused for a slight moment, as if the number really was hitting him. "There’s a lot of hours that went into that," Mewhort continued. "So 25 wins, when you see behind the scenes, it wouldn’t surprise you. Obviously, we’re at 24 right now and it doesn’t surprise me that we’re at 24 because of the way we’ve prepared and the hours that we’ve put into this. To get No. 25 would obviously be amazing. 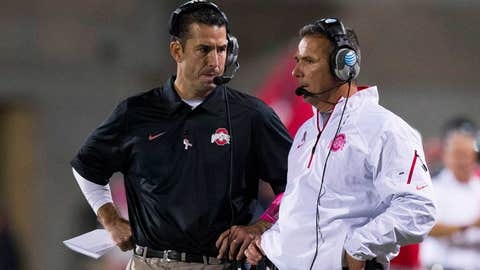 I don’t know the historical significance, but as a Buckeye football team, we’d be really excited about it." There would be any number of reasons for the Buckeyes to seem less than thrilled about their bowl situation. Settling for anything but a shot at the national title is understandably difficult. They came to South Florida missing some key players and with others injured. A flu bug has ripped through the team this week, even affecting quarterback Braxton Miller on Tuesday. Instead, they say the adversity and disappointment with the Big Ten loss — 34-24 to Michigan State, which earned a Rose Bowl nod — is fueling them. "It does make it easier when you do have that pain inside of you to teach young guys how to handle that," Buckeyes offensive coordinator Tom Herman said. "But at the end of the day, we want to win them all."